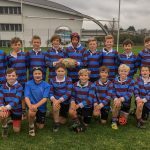 On Friday 16th November the Year 7 rugby team competed in the County tournament held at Richard Lander School in Truro. Playing some excellent rugby the boys finished as runners up in their first group which included Pool Academy, Camborne Science and International Academy and eventual winners Helston Community College. In the second round of games the boys continued to play some excellent attacking rugby to come out on top in a group with St Ives, Mounts Bay and Penrice. The boys were an absolute credit throughout the day and are eagerly anticipating the sevens competition next term.